Kara held a meeting with the Ministry of Land, Housing and Urban Development and Ministry of Health earlier in the year at which it was agreed that the engagement between Kara and the Ministries will be strengthened and streamlined. To realize this goal, the Ministry of Land, Housing and Urban Development has appointed Mr. Moses Gatana as the liaison person specifically tasked with handling Kara matters and ensuring that appropriate action is taken in a timely manner. Subsequently, Mr. Gatana has been handed the file containing various issues raised by Kara members and we expect a comprehensive response from him. In the same breath, the Ministry of Health has appointed Dr. Samuel Were as the liaison person for Kara and we already engaging him on a number of issues that are of interest to the Alliance. The 6th edition of the 3-days Kara training workshop for County leaders took place on the 16th-18th March 2016 in Nairobi. The focus of the training was on County Human Resources Performance Management for Better Service Delivery and it was attended by members of County Public Service Boards from Mandera, Wajir, Taita Taveta, Kitui, Uasin Gishu and Kwale Counties. The workshop was officially opened by the Chairperson of the Public Service Commission Prof. Margaret Kobia. Making her remarks, she highlighted the gains realized in streamlining and strengthening capacity of civil servants in Kenya. She advised participants to always ensure fairness and accountability while conducting their duties and challenged them to formulate and implement policies that promotes better management of human resources in order to enhances access to service delivery at the Counties. Speaking at the forum, KARA chairman Mr. Richard Nyaga encouraged participants to utilize the new skills and knowledge gained during the training to improve service delivery and access in their respective Counties. 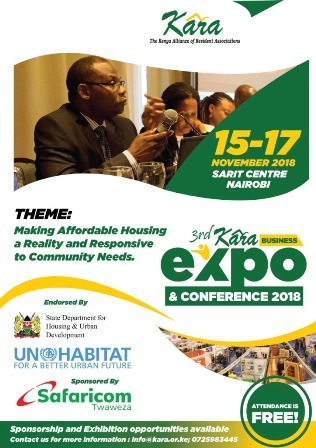 He stated that Kara will continue carrying out the trainings and will seek partnerships with various key institutions such as the Council of Governors, Public Service Commission and County Assembly Forums in order to build synergy and develop comprehensive training programmes based on existing and emerging needs. The workshop was officially closed by Mr. Justin Bundi, the Clerk of the National Assembly. Mr. Bundi explained the performance management mechanisms applied at the National Assembly to ensure better service delivery. He challenged participants to embrace and implement performance based human resource management at their respective Counties as a way of improving services and ensuring that Kenyans benefit from devolution. Kara was pleased to be part of the Annual General Meeting for North Coast Rate Payers & Resident Association (NCRRA) and Ngei II Langata Residents Association. Kara CEO Mr. Henry Ochieng addressed the NCRRA meeting and interacted with members on a range of issues that are of interest to North Coast residents. He challenged participants at the meeting to support the Association by participating in its activities and paying the necessary subscription as this will make it stronger in advocating for their interest. He advised the Association to actively engage the County Government in a structured way and push for better service delivery. Mr. Ochieng pointed out that due to lack of proper legal framework, Associations have challenges in enforcing their resolutions but this is being addressed through the ongoing push for a Residents Association Act. The Ngei II Langata Residents Association meeting was attended and addressed by Kara Chairman Mr. Richard Nyaga who noted members commitment and interest in the Association as reflected by the good attendance. Mr. Nyaga pointed out that the Association is a strong tool for advocating for members interest such as protection of open spaces and pushing for better services from the Government. Members should therefore provide all the necessary support to the officials to make the Association stronger. He stated that Kara is working on legislations aimed at making Resident Associations stronger. Karen Ngong View Estate Association members have gone to court seeking to stop the construction of an arts and culture exhibition centre in Karen following a row with the National Environment and Management Authority (NEMA) over their safety. Karen Ngong View Estate Association claims that the proposed Karen Village Culture and Heritage Centre, given the green light two years ago, may be a danger to their right to a clean, healthy as well as safe environment that is free from noise, stress and air pollution. The residents are aggrieved that the project is set to be put up in a plot which they were aware was for residential purposes, but has apparently been earmarked for commercial use, thus set to disturb their quiet serene neighborhood. The association has sued NEMA and the owner of the property in dispute – L.R. No. 12882/3 dubbed as Karen Village Limited. They argue that any proposed measures to prevent noise, health and safety hazards as well as uncompromised security for the residents have not been shared or agreed upon. The group claims that as residents they should have been consulted on the planned change of the plot from residential to commercial use. Kara The Annual General Meeting (AGM) for will be held on April 29, 2016 from 10am at the Secretariat offices. A formal notice with all the details shall be shared in due course. As you may be aware, only bona fide members who are up to date with their subscription payment are eligible to participate in the AGM. We therefore request those who are yet to regularize their membership to do so as soon as possible to enable us include you in the list of invitees for the AGM. 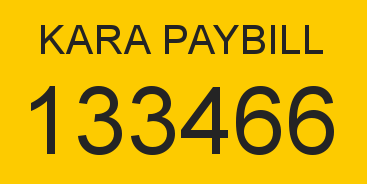 Payments can be made through cheque, cash or Mpesa paybill number 133466. We look forward to hosting you at the AGM.